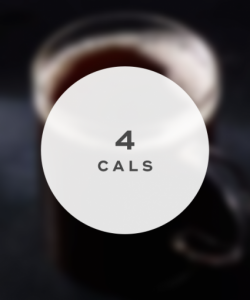 Order a Pike Place Roast filter coffee at Starbucks without any milk or sugar added, and it'll only set you back 4 calories. If you add two tablespoons half and half and sweeten it with some stevia, the total calorie count only jumps to 44 calories. Starbucks' Cool Lime Refresher is made with real fruit juice, mint, and a lime slice mixed with green coffee extract and served over ice. 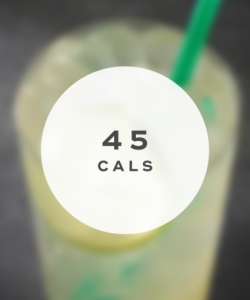 A tall Cool Lime Refresher only contains 45 calories, while a venti only has 90 calories. This refreshing lemonade combines Teavana black tea with mango and a hint of sweet passion fruit mixed with a splash of lemonade. The tall size only contains 90 calories. 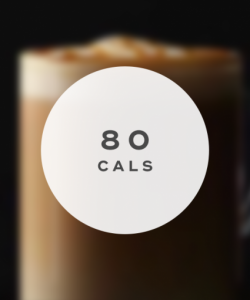 While regular Frappuccinos are known to have tons of hidden calories, this Coffee Light Frappuccino only contains 90 calories for a tall size. This uplifting lemonade is made with green tea blended with mint, lemongrass, lemon verbena, and lemonade, and then sweetened with a touch of sugar. 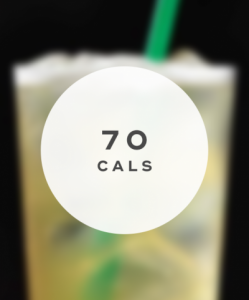 A tall size contains 70 calories, whereas a grande size has 90 calories. 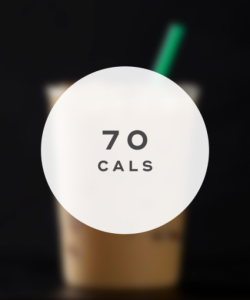 Starbucks' Iced Caffe Latte made with fat-free milk only contains 70 calories for a tall size and 90 calories for a grande size. You can shave off even more calories by opting for almond milk, which reduces the calories in each size by 20 calories. Starbucks' Cinnamon Dolce Latte is made with steamed milk and cinnamon dolce flavored syrup that is mixed with their classic espresso. 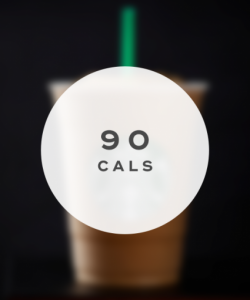 A short size of the Cinnamon Dolce Latte made with almond milk will only set you back 90 calories. Starbucks' delicious Caramel Macchiato is made with steamed milk, vanilla-flavored syrup, and espresso topped with a caramel drizzle. 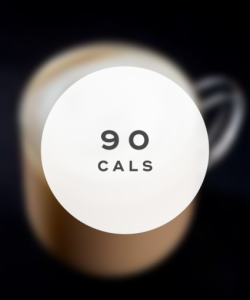 A short size made with almond milk is only 80 calories. Starbucks' Caffe Misto combines freshly brewed coffee with steamed milk in a one-to-one ratio. 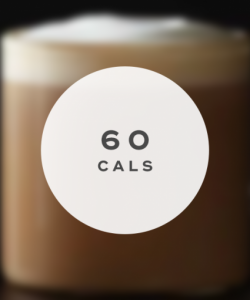 A tall size made with nonfat milk will only set you back 60 calories, whereas a venti size made with almond milk only has 60 calories. Starbucks' Vanilla Latte is made from full-bodied espresso blended with steamed milk and vanilla syrup. A short size made with almond milk instead of regular milk only contains 90 calories. Have your Starbucks, and drink it too! Just because you're on a diet doesn't mean you have to forgo Starbucks. 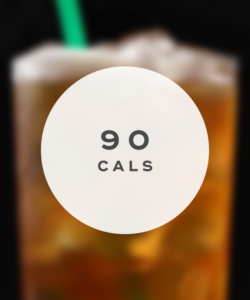 There are plenty of delicious beverages to choose from that are less than 100 calories each. You can easily lighten up any Starbucks beverage by asking for less syrup, requesting non-fat milk, and skipping the whipped cream. 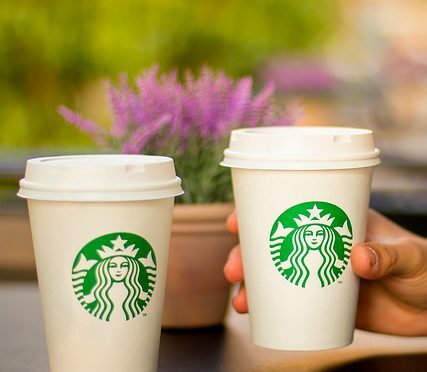 "15 Starbucks Drinks Under 100 Calories," Cosmopolitan, October 11, 2017. 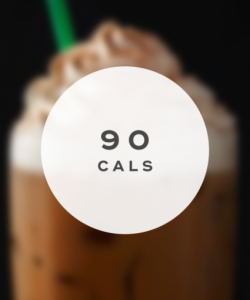 "10 Starbucks Cold Beverages 100 Calories or Less," Starbucks, n.d.
"10 Starbucks Drinks with 100 Calories or Less," Hungry Girl, July 22, 2016.